When one parent relocates, there are bound to be relocation issues involving child custody and Parenting Plan. LoDolce Family Law provides skilled guidance through mediation for men and women with parental relocation issues involving children, including interstate child custody and long distance visitation issues. 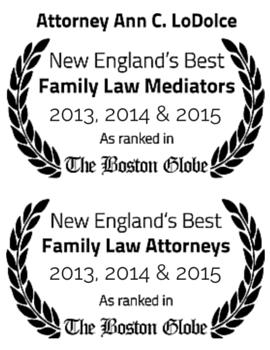 If you are in a situation involving parental relocation with children, whether you are the relocating parent or the parent remaining in Massachusetts,and whether you are the parent seeking a post-divorce modification of your child custody rights or your parenting time sharing (visitation) rights, Attorney Ann LoDolce can help you. The courts will look to what is in the best interest of your child or children. We can guide you in mediation to make the best possible parenting plan. In addition, we have an extensive network of professionals we can call upon to help determine what is in your children’s best interest. Complimentary upon making an appointment for an initial mediation meeting.